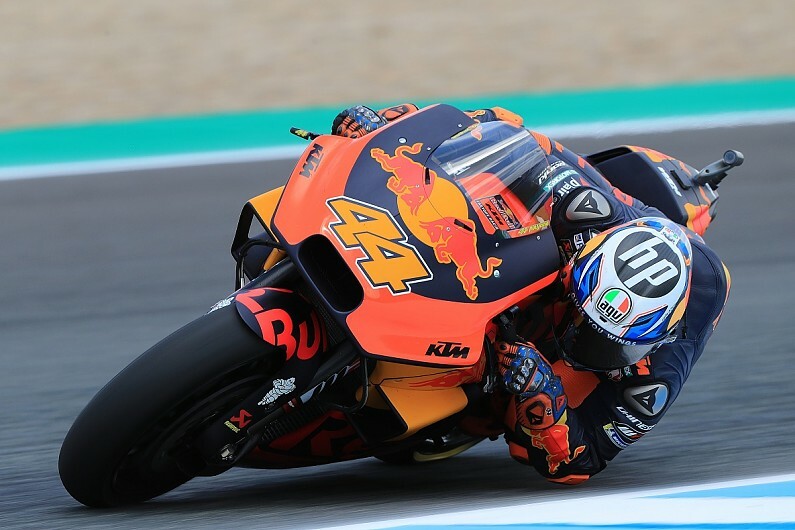 The prototype 2019 KTM MotoGP bike trialled in Spanish Grand Prix practice was so promising Pol Espargaro "almost couldn't follow" it on the '18 version. KTM gave the new bike its debut in a private test at Jerez last month, where Espargaro tried it, and is being used by Mika Kallio at this weekend's race for the first of his five scheduled wildcard appearances. Espargaro - who has secured a new contract with KTM through to the end of 2020 - found the new bike to be "faster" than the current RC16, especially on used rubber over a race distance. "I will confirm in the test that the bike was faster, for me it was quite [a lot] faster," said Espargaro. "Especially with used tyres on the race distance, in low grip, and Mika is confirming it. "I've been behind Mika in the first of the practices with used tyres this morning, and this afternoon, and I almost couldn't follow him. "Mika's fast, but I know how this bike feels in Jerez and it's exactly the same. "Everything looks positive and on the way." Kallio was 12th and 14th in Friday's two practice sessions, with Espargaro third in the morning and 11th later on. "This is a new version that is based pretty much on the next year's model already," said Kallio. "For sure it will be interesting to see what the race performance of the new bike is." Espargaro confirmed he will not be racing the new bike in the near future. "It's something interesting for me, but there is something in the rules," he said when asked if racing the new bike was an option. "It's not easy to make a new bike like this one, like Mika is using, in one month. "You need to make some kilometres and know that it's going to work - you cannot spend the money for nothing." Espargaro added that his third place in the morning was achieved by following Valentino Rossi, and was the "limit" of what the KTM could do at Jerez. "The last split was nice. It was FP1, we must be happy for sure but it was just FP1 and we knew it," he said. "The only problem is that we reached more or less the top level of our bike really soon. "I'm able to do a fast lap time very fast, but then to improve that you need different tools, and I think that we are not on the limit, but we are reaching the limit of the bike. "So now it's going to be difficult for us, it's going to be easier for them to improve from this morning to qualifying by maybe two seconds. "But anyway, it was really nice. "We came from the first three races where, in the first two or three corners, we lose, for example, Valentino, and here I was catching him."